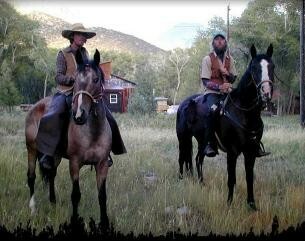 Riding from Colorado to Mexico! 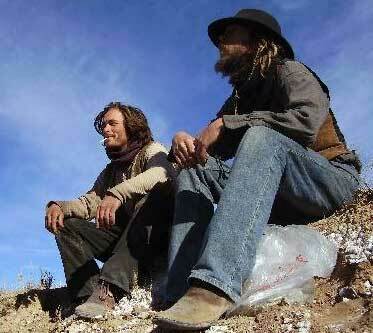 Adam del Amor and Jeremiah Bayes are riding from Colorado to Mexico! 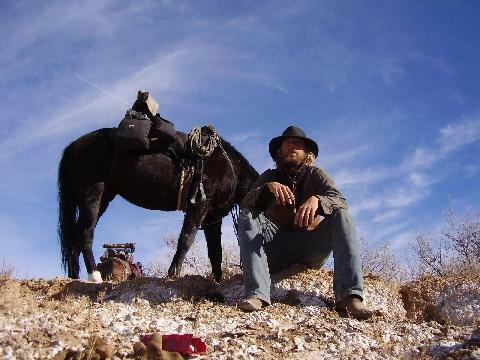 "We hope to make a 2000 mile horseback ride from our home in Colorado down to Mexico. We carry the intention of being of service along the way... helping out old ranchers and folks on the Navajo and Hopi reservations with their homes and work. Also, we have non-profit status and are running a pledge drive to share with seven different non-profit groups, both local and national. Care of our friends the horses is top priority. We will travel slow and easy. Connection, respect, presence and honor take the reins over covering the entire distance." We wish you a happy and safe journey! At the insistence of John Mestas and his son Alex, we left out of Manassa, Colorado in a Dodge diesel, towing the horses behind us. The cold was bitter, relentlessly numbing our digits, but not our spirits nor our determination. Alex drove us over the icy, lifeless Chama Pass, saving us a five day ride thru the the frozen countryside that surely would have taken its toll on us and the horses. We were dropped off in a parking lot in Chama... New Mexico at last!!! The air was a few degrees warmer, the grass a little greener, and for the first time since we left, we could no longer see the Crestone Peaks from which we departed. The magnitude of this adventure began to take shape, and we started riding south with a fresh and excited energy. For three days, we followed the side of a paved road, sleeping out under the stars, until we came upon two retired police officers riding their bikes twenty four miles round trip to the post office in Tierra Amarilla, New Mexico. Gretchen and Grady invited us back to their earthship home, where we spent two days expanding our hearts and minds with kind, sweet conversation and the first green salad we'd seen in two weeks. We shared songs and ideas with these kindred spirits... fellow travellers and rebels at heart. They inspired us with their openness and their prolific ways of creation... artists, cabinet and kayak makers, bio diesel chemists, and they catch all the water they use to live on their rooftops!!! The time came for us to move on, so we repacked to lighten our loads, and headed out into the brutal winds of the New Mexico desert. We crossed the ancient dam at El Vado and moved slowly thru the Jicarilla Apache Reservation, surrounded by divinely placed cliffs of yellow and gold rising up out of the rolling hills covered in sage and juniper. By this time, our steeds seemed to both accept and anticipate the day's routine... highlined to graze at night, a heavy dose of grain in the morning as we pack them up, and then walking, trotting, walking thru the day... anywhere from seven to twenty one miles, depending on the weather, water, and grazing we encounter. This pattern seems to groove with their natural tendency to keep moving and their willingness to work...They are shining examples of true service, strength, and courage, beckoning us to rise up to the opportunity to respect and honor their bodies and souls. Give thanks!!! So, the cold returned with a fury, dropping down to five degrees below zero at night. The camp fire became our church, luring us to sleep at night and thawing us out in the morning. We pushed on, following dirt roads down uninhabited canyons, god's country speckled with the blemishes of an industry on the verge of extinction... oil rigs and tanks and pipelines humming and backfiring in the otherwise silent landscape. We arrived in Lindrith, New Mexico an hour after sunset in the harsh cold, hoping to find a cafe to warm up in. Turns out there ain't much in Lindrith... a post office, deserted rodeo grounds, and that's about it. Except, of course, for some of the kindest, most down to earth folks we've ever met. Paul Sturdevant passed us on the road and stopped to talk. He ended up helping us stall and feed our horses at the rodeo grounds and offered us shelter and a hot meal. His lovely wife, Eva, dished us out some homemade chilli with locally grown beef, and Jeremiah ate meat for the first time in seven years. He's still processing and digesting that one, and is back to being a vegetarian these days. We stayed for three nights, meeting their whole family, helping Alcarillo and Amadeo remodel the laundry room, and discovering that our different perspectives acted more as a conduit for energy exchange than as a hindrance in communication. Our willingness to judge those who live differently than us is rapidly falling away with every mile we cross and every beautiful person we meet. God bless the Sturdevant family and the comforts of their home. I am astonished at the willingness of people outside the Crestone Community to contribute to the pledge drive. Folks who have nothing to give INSIST upon making donations to a school and a library that will benefit children a hundred and fifty miles away... our children, our neighbors, our community. Meanwhile, these people are forced to ship their own children to a school two towns away, due to the lack of economy and funding in their community. Amazing, and I am moved and inspired by their actions. God bless their generosity, their kind hearts, and their faith in our intentions.